GEELONG, Australia, CMC – Rain marred West Indies’ final match practice for the critical Melbourne Test starting Boxing Day, when it allowed only 58 overs on the final day of their two-day tour match against a Victoria XI here yesterday. The tourists declared their first innings at their overnight 303 for eight but hopes of giving their fast bowlers are extended work out where then scuppered by the adverse weather. Victoria XI ended on 169 for three with Jake Hancock unbeaten on 80. Tom Donnell made 34 and captain Ian Holland, 29. 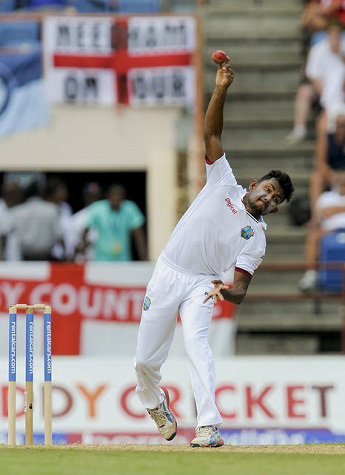 There was time enough, however, for Devendra Bishoo to pick up two for 60, to be the Windies’ best bowler. West Indies started brightly when fast bowler Kemar Roach claimed Travis Dean for three to a catch by Jermaine Blackwood at point, fending off a short ball with the score on 13. The Caribbean side were then held up by two stubborn partnerships. Opener Hancock, without a first class game to his name, then added 73 for the second wicket with Donnell and a further 46 for the third wicket with Holland. Hancock, who faced 173 balls and struck seven fours and three sixes, was missed at 22 when Jerome Taylor missed a catch at fine leg. West Indies clash with Australia in the second Test at the Melbourne Cricket Ground in six days, hoping to atone for their miserable outing in the first Test at Hobart which they lost by an innings and 212 runs inside three days. WEST INDIES 1st Innings 303-8 decl. Fall of wickets: 1-13, 2-86, 3-132. Bowling: Taylor 9-4-14-0, Roach 7-1-21-1, Holder 5-1-19-0 (w1, nb2), Brathwaite 8-1-35-0, Bishoo 18-3-60-2, Warrican 11-5-7-0. Umpires: S Brne, D Shepard.